After my Learn to Crochet class at Sew Make Create I got straight onto making a GIANT granny square blanket. I have one that my mother made when I lived with her and I've always wanted to make one of my own...and now I can! 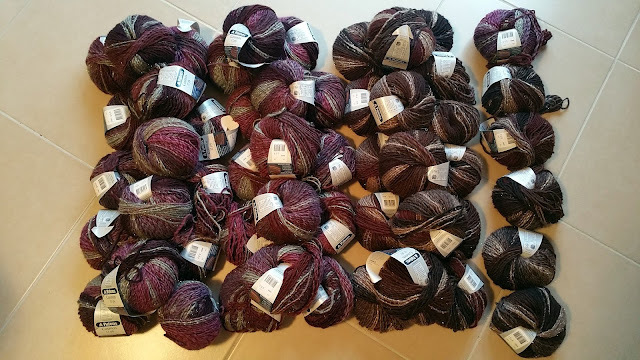 For some reason now unknown to me I had two balls of this wool at home from Lincraft (probably bought for weaving)...it's a lovely variegated (?) blend (50% Acrylic; 47% Wool and 3% Polyester) with a metallic-look yarn mixed in. Of course two balls is not enough to make a blanket so I ordered eight more online from Lincraft (all they had left in stock). 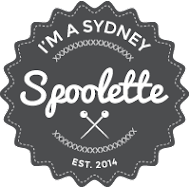 Yeah...that's STILL not enough so I bought MORE from Lincraft in Parramatta and then Castle Hill. I think I had 56 balls in total. Needless to say I had WAY too much wool and have enough left over to make a second blanket later down the track. 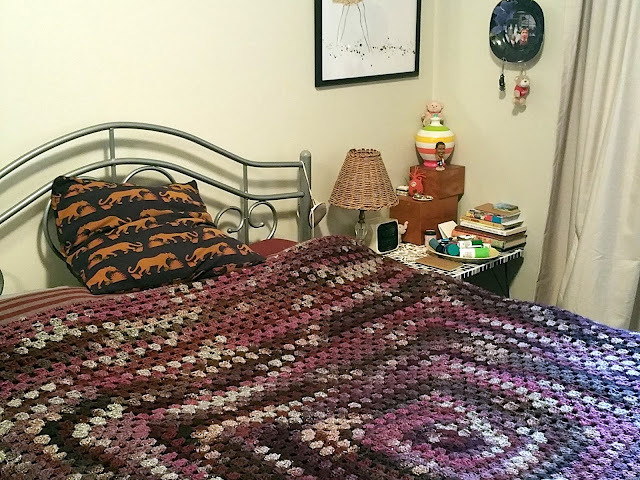 I started this blanket in April after my class and finished it in June. 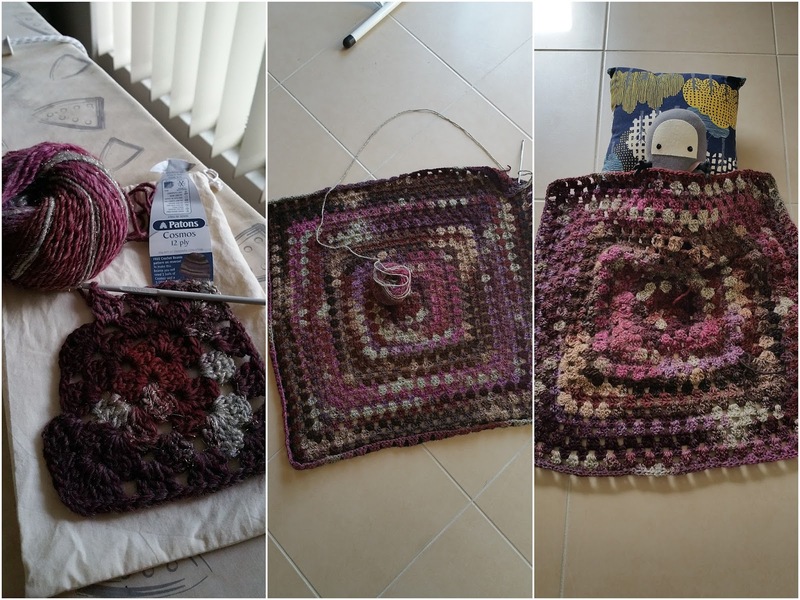 As the blanket got bigger my crocheting waned but I got there in the end. 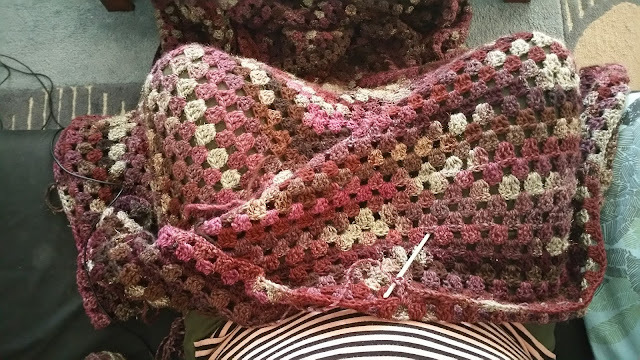 It was nice to sit on the couch and crochet under the blanket once it got bigger. I am yet to "edge" the blanket but have decided to put it on my bed whilst the weather is still cool enough for a blanket. It feels my double bed well and I LOVE it!